Korean Night Festival is a yearly celebration of the Korean culture and arts held by a local Korean Language centre, Dae Han Education. Each year, there are different themes and games to let people who are interested in Korean culture learn more and also for the K-pop enthusiasts to stage performances. This is their 5th year of this event, and its slated to attract 600 visitors this year! Like I mentioned that there are different themes each year, this year's theme is... Running Man! That's my favourite variety show now! There'll be booths where you can play games that were on Running Man, try on a hanbok and then take a picture etc. 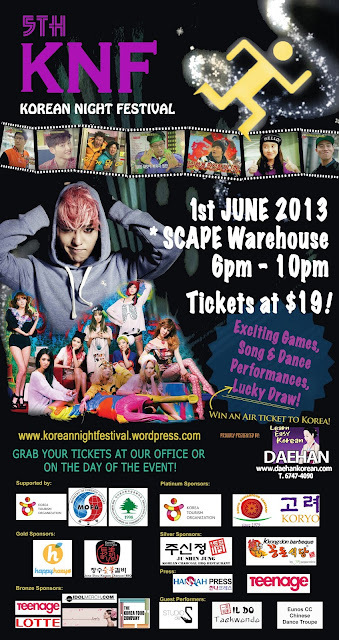 Also, there'll be kpop acts of dancing and singing so do come down and join the fun! I believe its an awesome event to enjoy the Korean culture, have a fun day out and also to make friends who have the same interests as you. Do check out their website and Facebook page for more information and updates about this cool event and I'll see you there!